Although no archaeological remains have been found that show that it was used in pre-Columbian times, it is assumed that it was the Guaraní Indians who taught the Spanish how to use yerba mate. What seems to be a direct consequence of the discovery is the fact that the Jesuit missionaries, around 1670, already had artificial Mate plantations. In time, the settlements of Guaraní Indians converted to Christianity and became economically dependent on Mate production. The expulsion of the Jesuits from the Spanish dominions in 1767 was a step backwards in the history of yerba mate. The Indians drank the infusion made from the leaves of Caa directly from an earthenware pot without using the bombilla (a long tube with a strainer at one end). They filtered the drink with their teeth, spitting the leaves out from their mouths, or they sucked the mate through a cane. 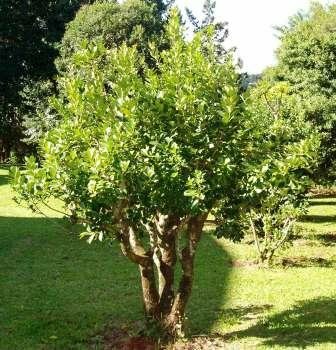 The Spaniards adopted mate almost immediately and they called the leaves "Herb from Paraguay" not knowing that the plant was a tree. At the end of the XVIth century the first Jesuits arrived. Their mission was to evangelize the Indians. At the beginning they considered mate drinking a dangerous habit so much so that they even presented it as a case before the Tribunal of the Holy Inquisition in Lima in 1610. Later on mate was accepted, and the Jesuits even encouraged its use as a solution to the problem of drunkenness. The Indians used to get drunk on chicha which is a highly alcoholic drink obtained from the fermentation of the fruit of a tree call algarrobo (carob tree). In order to identify their own mate, the Indians and then the Spaniards started carving their names on it or they painted the mate. They also covered the mate with leather to protect it, especially in those provinces where it was difficult to get a gourd. The Jesuit missionaries who followed are responsible for research into this plant, and the most important discoveries for raising it. They managed to cultivate the bush and establish mate plantations. Hence, the plant's moniker, "Jesuit Tea." According to dictionary entries, the plant's botanical name is ilex paraguariensis, or "yerba tree", of the genus, "holly palms." In the mid XVIIIth century mate was drunk by all social classes. When it started being drunk in Buenos Aires each family had a special servant in charge of brewing mate, sometimes even two, one for sweet mate and another one for the mate served plain (cimarron). powder and sand. Today the first mate is drunk by the cebador, the person in charge of preparing mate. jungle again, where it grows wild. where the Jesuits had had theirs. Today there are 130,000 hectares under cultivation. Bolivia, Chile and Peru, and massively, Argentina, Brazil, Paraguay and Uruguay are mate consumers. From the Indians in the Pampa to the European immigrants, all have adopted the beverage. Today it is considered the national drink in Argentina. Yerba Mate is produced only in three countries, being Argentina with more than 165,000 hectares which holds the largest acreage, followed by Brazil with 85,000 and 35,000 hectares Paraguay. Argentine Yerba Mate has recently acquired Geographic Indications (GI) or "Denomination of Origin". Foods such as Gorgonzola, Parmigiano-Reggiano, the Waterford Blaas, Herve cheese, Melton Mowbray pork pies, Piave cheese, Asiago cheese, Camembert, Herefordshire Cider, Cognac, Armagnac and Champagne can only be labelled as such if they come from the designated region. To qualify as Roquefort, for example, cheese must be made from milk of a certain breed of sheep, and matured in the natural caves near the town of Roquefort-sur-Soulzon in the Aveyron region of France, where it is colonised by the fungus Penicillium roqueforti that grows in these caves. This is a regulation that ensures only products genuinely originating in a specific region are allowed to be identified as such in commerce. The purpose of the law is to protect the reputation of the regional foods, promote rural and agricultural activity, help producers obtain a premium price for their authentic products, and eliminate the unfair competition and misleading of consumers by non-genuine products, which may be of inferior quality or of different flavour. Pharmacological and Botanical Studies, Buenos Aires, Argentina.